I'm nearing 40,000 pageviews and thought it was about time I gave away another freebie. I've added my Adventure Time Jake the Dog plush to the "Patterns and Downloads" page. There aren't any instructions included with the .pdf, just the pattern pieces, but you can probably figure it out pretty easy. When you print the pattern I recommend setting it to 100%, not "fit to page." The pieces should fit together like a puzzle and tape the pages together before cutting out the pieces. I also recommend opening it in Adobe Reader and not GoogleDocs. Make sure you add the amount of seam allowance that you feel comfortable with. I usually add about 1/4" to 3/8". Sew the tail first, then insert it into one of the darts in the body (this will become the back), sew the rest of the darts. Then sew the arms and legs, turn and stuff. Then pin them inside the body in the orientation you want (look at my pics to get an idea) sew the body closed, right sides together, except for a small hole, turn and stuff. Sew the hole closed. Sew the ears, jowls, and nose, turn and stitch closed (no stuffing). Cut the eyes and mouth. Then sew on the face. I sew it all by machine except for the closing and adding the face/ears. For the body I use golden yellow anti-pill fleece (you can get this at most craft/fabric stores like Joanns) and also a very small amount of black anti pill fleece for the nose and mouth. For the eyes I use black and white felt, but fleece might even be better. And I stuff him with poly-fil stuffing. I would love to see your creations! The Jake pictured above is made by one of the followers of this blog, isn't he super cute! You can email me using the button in the side bar if you have any questions! I'm so glad you shared your pattern. My daughter got invited to a birthday party on Monday, the party is on Friday evening, it doesn't leave much time for a full time working mother and wife to go shopping, specially since it's a new friend, we aren't sure what to do but she loves adventure time and I can sew! So 1000 thank yous from me!!!! If it looks halfway decent I'll email you a photo! how did you sew the ears onto the body? and same with the jowls? did you just hand stitch them on or what? The ears and jowls are hand-stitched on after the body is complete. How much fabric should I purchase for this project if I am a beginner at sewing? I would buy at least a yard. It might seem like a lot, but then you'll have some extra in case you make a mistake or want to make a second one! I love this. 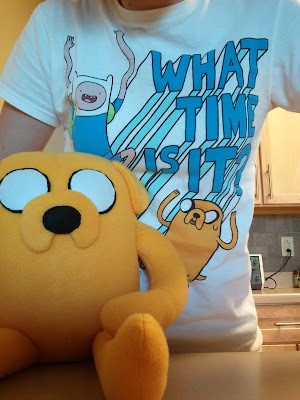 Maybe I should make my own Jake. I also like Adventure Time and even do real adventures myself with battlehunk. What is the height and width of this Jake plush? I made this today (didn't have the right colours but I've been wanting to make this really bad and finally have a printer lol) it was super easy and quick to make... I'm pretty surprised, usually the first time I make something it takes me awhile but not this, it's a really good size too! My daughter hasn't stopped playing with him, she even said Jake had to have bacon pancakes for dinner so we did, thank you SO much! Thank you for making this pattern. I have a very happy little boy, and I'm working on one for my friend. I made one of these for my great nephew in Texas. Thank you so much for sharing the pattern! Thank you for the great pattern and instructions. I am about to have a go at Jake. My grandson will love him. Let you know how it goes. Norma, Sydney Aust. I can't get the pattern to download. I'd appreciate it if you could email it to me or something. My little sister would absolutely love a hand sewn Jake. Thank you so much for the pattern - my little boy is thrilled. Now I have to figure out how to make a Princess Bubblegum for his little sister.